What’s the Stem Cells Buzz this Week? - Regulating Neural Patterning, Cardiac Mesodermal Progenitors, iPSC Chondrogenesis with SMAD4, and Late Endothelial Progenitor Cells! While studies have established the importance of several morphogens in anterior-posterior (A‐P) neural patterning, the mechanisms that regulate said morphogens remains relatively unknown. Now, new research from the lab of Anton M. Jetten (National Institutes of Health, NC, USA) established an essential role for the Krüppel‐like zinc finger transcription factor GLI‐Similar 3 (GLIS3) in the direct differentiation of human embryonic stem cells (hESCs) into posterior neural progenitor cells (NPCs), rather than the default anterior pathway. In this STEM CELLS study, Jeon at al. 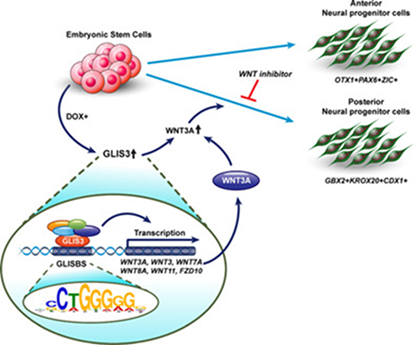 also report the importance of GLIS3-mediated transcriptional activation of WNT genes, including the strong posteriorizing factor WNT3A, for A‐P specification. In the hope of understanding the stage‐specific molecular mechanisms of human cardiomyocyte progenitor formation and subsequent differentiation, researchers from the lab of Kenneth R. Chien (Karolinska Institutet, Stockholm, Sweden) recently defined the role of SMAD4 at the earliest stages of human cardiogenesis via the generation of SMAD4 mutant human embryonic stem cells (hESC). In summary, Xu et al. defined the role of SMAD4 at the earliest stages of human cardiogenesis, and the team anticipate that their findings will encourage research into human stem cell models of development and disease, treatments for congenital heart defects, and TGF beta signaling pathways. See STEM CELLS now for all the details. As the low efficiency and variability of chondrogenesis in human induced pluripotent stem cells (hiPSCs) represent a significant hurdle to their clinical application, researchers from the labs of Farshid Guilak (Washington University, St. Louis, Missouri) and Charles A. Gersbach (Duke University, Durham, NC, USA) sought to construct an improved differentiation protocol. In STEM CELLS, Adkar et al. 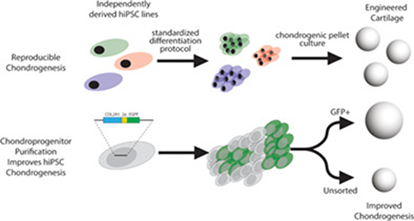 now report on a highly efficient chondrogenic differentiation protocol via stepwise specification through a mesodermal lineage and the application of a genome‐engineered COL2A1‐GFP knock‐in hiPSC line to identify a purified progenitor population with improved chondrogenic potential. The team hopes that the development of processes for rapid and repeatable chondrogenic induction of iPSCs will enable the identification of novel therapies for joint diseases such as osteoarthritis. The isolation of late endothelial progenitor cells (LEPCs), circulating blood cells that can promote vascular repair, may represent an important cell type for the treatment of numerous conditions. 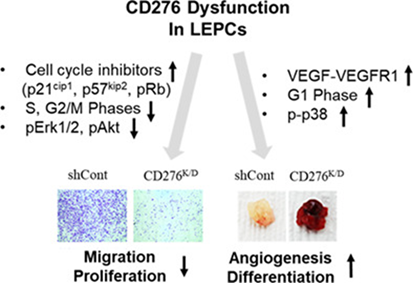 Recent research from the lab of Je‐Yoel Cho (Seoul National University, Korea) discovered elevated cell surface expression of CD276 (B7‐H3) of LEPCs and its requirement for proliferation and migration. However, Son et al. established that this type I transmembrane glycoprotein inhibited endothelial cell differentiation, suggesting that B7‐H3 functions to maintain the cells in the progenitor stage. Overall, this STEM CELLS study indicates that B7‐H3 can be employed to acquire and maintain LEPCs, while blocking B7‐H3 promotes angiogenetic differentiation.